These roasted garlic greek yogurt smashed potatoes are decadent and healthy all at once. I had (and still have) a really hard time accepting the fact that I’m 30. I know everyone is all “30 is the new 20…blah blah blah” but I call bs on that one. And to be honest, I don’t want to be 20 again. I’d just be really happy having stayed 28 or 29 forever. Old enough to sort of have a grasp on my life and be taken seriously professionally, but with an age that started with a 2 not a 3. We have a joke in our house that it’s all downhill from 30. When Ulysses hit it (he’s 2 years older than me) he got the flu, herniated a disc in his neck, had an old shoulder injury resurface and threw out his back all in the span of about 2 months while I sat on sidelines, feeling healthier than ever. Fast forward 2 years, I turned the big 3-0 last April and nothing happened. I started Crossfit in the summer, felt stronger than ever before and mocked Ulysses when he’d say “just wait…it’s coming”. And come it did. I got tendinitis in my wrist in November, threw my back out in December, came down with the flu (after not having had a cold for almost 2 years) the same day I threw my back out, got sick again with another cold this past weekend and literally stood up from sitting in a chair yesterday when my foot just gave out with random sharp shooting pains that have left me hobbling around. And that’s all on top of the fact that the gray hairs on my head literally seem to proliferate faster than bunnies. I’m pretty sure the curse of 30 has officially caught up to me. So instead of sulking (which I’m really good at doing) about being sick this weekend and having to stay 10 feet away from my husband who I only get to see on weekends to keep him healthy thanks to this curse, I decided on comfort food. I haven’t had mashed potatoes in what seems like forever and with a fridge full of Voskos Greek Yogurt, I decided that needed to change. I also decided roasted garlic and pan fried sage were a necessary addition because…why not? 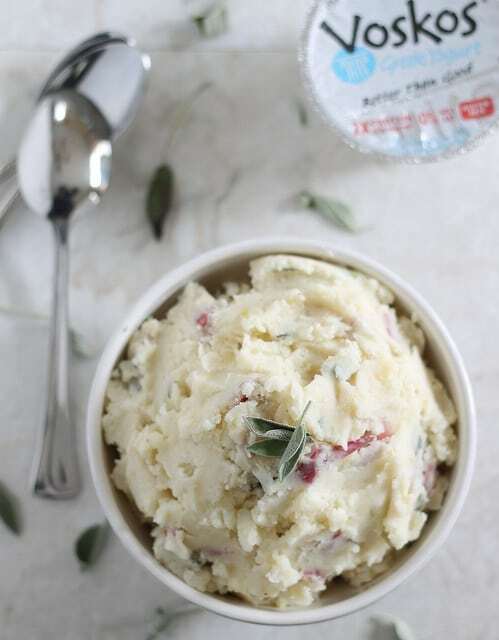 The yogurt gives the potatoes the perfect creaminess and comfort factor without any actual fat and the roasted garlic and sage make these anything but your typical mashed potatoes. I’d still rather be 29, injury and sickness free, but these are a pretty damn good consolation. I’ll try to remember that when I’m plucking out gray hairs in the mirror. Cut off the tips of the head of garlic and drizzle with 1/2 tablespoon of the olive oil. Wrap the garlic in aluminum foil and place on a baking sheet in the oven. Roast for about 40 minutes. Meanwhile, place potatoes in a medium pot with cold water and bring to a boil. Reduce heat to a simmer and cook potatoes for about 30 minutes until fork tender. Add the remaining 1/2 tablespoon of olive oil to a small skillet over medium-high heat. Once hot, add the sage and pan-fry for about 1 minute until aromatic and starting to crisp. Add the fried sage to the potatoes. At this point the garlic should be roasted. Remove from oven and let cool until you can handle it. Squeeze the roasted garlic cloves out into the bowl with the potatoes and sage. Add the Voskos Greek Yogurt and salt & pepper to the bowl. 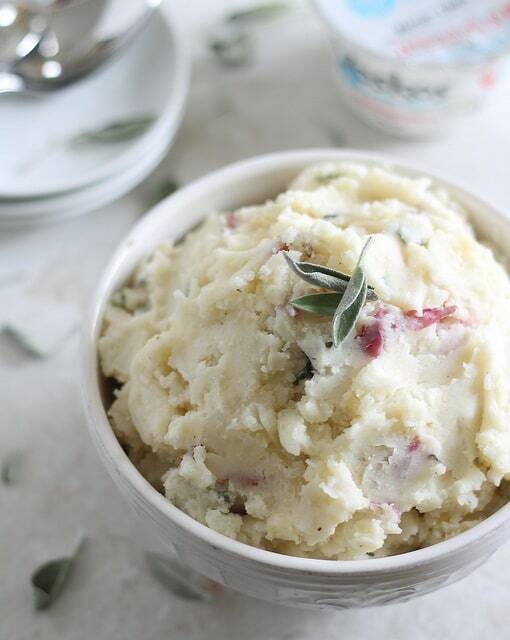 Mash with a potato masher until all ingredients are incorporated into the potatoes but the texture is still "chunky". This post is sponsored by Voskos Greek Yogurt, however, all opinions are my own. I love yogurt in potatoes, makes them so creamy! I never hears of Voskos Yogurt, I’ll have to check them out! I’m almost 35 but people always think I’m younger. I don’t know if it’s good or bad when someone finds out my real age and they say something to the extent of, “I had no idea you were that old!” Hmph. Nothing beats potatoes. I’m pretty sure when I turn 30, I’m going to need some major comfort food like this. Just bowl after bowl. Just wait until FORTY is staring you in the face! Forty is not my friend, never will be. You might have caught on to something there. All of my weird issues seem to have happened after a certain age. Then again I like to blame my kids for aging me too. But look at you shoving potatoes in my face first thing in the morning… now I’ll be thinking about them all day. 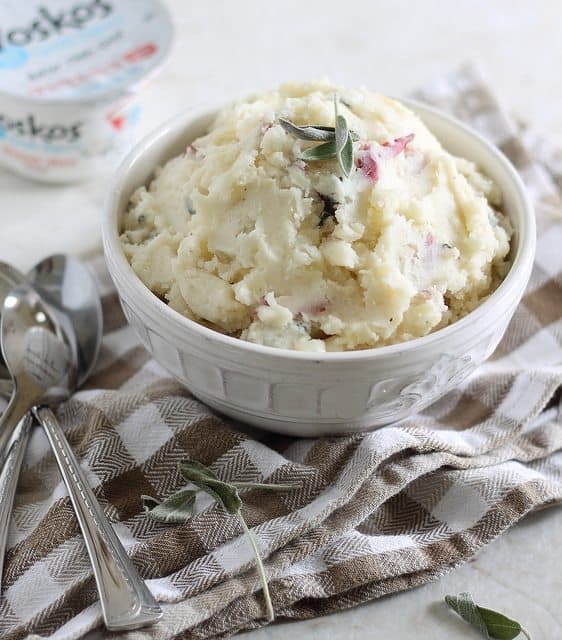 I would have never thought to add yogurt into mashed potatoes! They look delish! This will definitely get added to my list of must-try recipes.